We usually serve fried eggplant as a side dish. With only five ingredients, Begoon Bhaja is one of our favorite recipes. Unlike other fried foods, this dish comes out more soft than crispy, with the mustard oil making a light gravy with the flavor of eggplant infused. 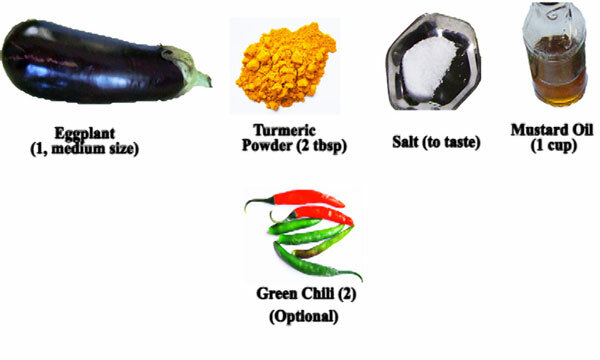 We love to mash the eggplant into our rice, but you can eat it separately as a side along with daal. We strongly recommend that you try it with rice alone and depending on your tolerance to hot food, with a small piece of fried green chili. 1. Cut the eggplant into about quarter inch thick slices. 2. In case of a long thin variety of eggplant, keep the stem and slice the eggplant lengthwise into four parts. 3. The stem will keep the four parts together. 4. Place them on a plate. 5. Sprinkle the turmeric powder over the slices. 6. Then sprinkle salt over it. 7. Marinate the slices by hand. 8. In a moderately hot pan, pour in the mustard oil. 9. Though other oils can be used, we recommend that you use the extra virgin mustard oil. The pungency of mustard oil always adds the authentic Bengali flavor. 10. Coat the pan evenly with the oil. 11. When the oil is hot, put in the slices of eggplant. 12. Add couple of green chilies. 13. Then cover the pan. 14. Though green chili is optional, we feel it adds a unique flavor to the dish. 15. After several minutes, remove the cover and turn the pieces over. 16. Lower the heat if it is on high. 17. Continue turning over the slices till the eggplants acquire a fried brown color. 18. Turn off the heat. 19. And remove the fried eggplants from the oil onto a plate. That’s it! Serve the Begoon Bhaja with hot steamed rice and Daal.